Background and objectives: Determining whether the femoral head collapses and the degree of collapse of the articular cartilage of the femoral head can help select the best surgical treatment plan for patients with osteonecrosis of the femoral head. Currently, articular cartilage collapse > 2 mm or < 2 mm supports palliative surgery and hip arthroplasty, respectively. However, the ideal method to preoperatively predict femoral head collapse remains controversial. We hypothesized that computed tomography (CT) and X-ray imaging can effectively predict collapse of the necrotic femoral head before hip arthroplasty. Our preoperative measurements highly matched measurements of the intraoperatively-resected femoral head specimens. Design: A single-center, open-label, diagnostic trial. Methods: We proposed, and subsequently conducted, a single-center, open-label, diagnostic trial at the Third Hospital, Hebei Medical University, China. Eighty-six patients with unilateral osteonecrosis of the femoral head who underwent total hip arthroplasty were randomized into three groups. In the X-ray group, changes in femoral head height were measured on anteroposterior X-ray images of the pelvis (healthy and affected sides of the hip) at preoperative week 1. In the CT group, changes in femoral head height were measured using bilateral hip CT scans (healthy side and affected side) at preoperative week 1. In the specimen group, the femoral head on the affected side was resected surgically and measured directly with a ruler and vernier caliper. The primary outcome of the trial was the sensitivity of the three methods to detect femoral head collapse. The secondary outcomes were specificity, positive predictive value, negative predictive value, positive likelihood ratio, negative likelihood ratio, and diagnostic accuracy of the three methods to detect femoral head collapse; the consistency of X-ray and CT scans to diagnosis femoral head collapse; changes in the height of the middle, medial, and lateral femoral head measured by the three methods; and morphological changes in the femoral head observed by the three methods. Results: Changes in the height of the femoral head detected by different methods: The heights of the middle, medial and lateral femoral head were not significantly different on the affected side (P > 0.05). Discussion: This trial analyzed femoral head height using X-ray, CT, ruler and vernier caliper to precisely predict collapse of the necrotic femoral head, and provides imaging guidance for clinicians to select the best surgical management for osteonecrosis of the femoral head. Trial registration: ClinicalTrials.gov identifier: NCT03351153. Osteonecrosis of the femoral head (ONFH) is a common and frequent disease, and the main clinical manifestations are hip pain and dysfunction.,,, The etiology and pathogenesis of ONFH are varied and not yet clearly defined; however, a satisfactory therapeutic result requires surgery. The best prognosis requires knowledge of the surgical indications and appropriate treatment measures, especially consideration of the large difference between palliative surgery and hip arthroplasty. Determining whether the femoral head has collapsed and the degree of collapse of the articular cartilage of the femoral head can help physicians select an optimal surgical plan.,,, Chinese scholars commonly believe that if femoral head collapse is < 2 mm, autologous bone grafting, allogeneic bone grafting, and other palliative surgeries are options. If femoral head collapse is > 2 mm, total hip arthroplasty is recommended. However, these standard cutoff measurements have not been extensively accepted worldwide. Several methods can be used to predict femoral head collapse, but it remains controversial which method is the simplest and most accurate.,, We classify the prediction methods into two types: (1) Necrosis range: the wider the necrosis range, the larger the foci. Without active intervention, collapse is rapid, and the prognosis is worse. (2) Necrosis site: necrosis of the outer upper quadrant is more likely to result in collapse. Even with active intervention, the risk of collapse is high, and it is difficult to avoid joint replacement. Despite these considerations, there is no consensus on the best method to preoperatively predict femoral head collapse. We aimed to verify that computed tomography (CT) scans and X-ray can predict collapse of the necrotic femoral head before hip arthroplasty and effectively guide the surgical management. A single-center, open-label, diagnostic trial. Third Hospital, Hebei Medical University, Hebei Province, China. Eighty-six unilateral ONFH patients undergoing total hip arthroplasty were included in this trial from July 2010 to January 2012. Patients were randomized into three groups: specimen group (affected side), X-ray group (healthy side and affected side), and CT group (healthy side and affected side). In the X-ray and CT groups, the heights of the femoral head were measured using X-ray and CT, respectively, at preoperative week 1 on the affected side and healthy side (self-control). In the specimen group, the height of the surgically-resected femoral head was measured with a ruler and vernier caliper. We aimed to identify the consistency of the femoral head height measured using preoperative X-ray and CT, and intraoperative ruler and vernier caliper, and to effectively guide the formulation of the operative plan. A flow chart of the trial protocol is shown in [Figure 1]. Included patients' baseline information, demographic data, and general disease history were collected before surgery using a questionnaire. Harris Hip Score was determined by health examination. Ficat stage was determined using preoperative imaging [Table 1]. Based on our previous experience, we hypothesized that the sensitivity or specificity of X-ray or CT to determine femoral head collapse would be 90%. Using б = 0.05 and μ0.05 = 1.96 with a significance level of α = 0.05, we calculated a final effective sample size of n = 139 per group using the formula , where p refers to sensitivity or specificity. Assuming a patient loss rate of 20%, we required 167 patients per group; therefore, we included 86 patients based on the inclusion and exclusion criteria with all patients undergoing CT and X-ray imaging, and hip arthroplasty. Using a simple random-sampling method, we collected intraoperatively-resected femoral head specimens from 86 unilateral ONFH patients who underwent total hip arthroplasty at the Third Hospital, Hebei Medical University, China from July 2010 to January 2012. We also collected each patient's X-ray and CT imaging data at preoperative week 1. The femoral head specimens were numbered sequentially, and corresponded to X-ray and CT data. The purpose and content of the trial were discussed with each patient or their family members for patients meeting the inclusion criteria. Patients and their families gave signed informed consent before enrolling in the study. After inducing anesthesia, patients were placed in a lateral position. The affected side was up and was sterilized with iodine and ethanol. A posterolateral incision (approximately 15 cm long) was then made as follows: Considering the greater trochanter as the center, the proximal end was 1/3 lateral to a line between the posterior superior iliac spine and the greater trochanter; the distal end was at the distal thigh. Skin, subcutaneous tissue and fascia were incised to expose the insertion of the extensor tendon on the greater trochanter. The tendon was cut at its insertion and reflected proximally to expose the posterior articular capsule. The articular capsule was then incised in a T-shape. Intracapsular effusion was aspirated, and the hip joint was dislocated. The femoral head was transected using an electric pendulum saw perpendicular to the femoral neck and collected [Figure 2]A, [Figure 2]B, then numbered separately (No. 1–86). Following lavage with physiological saline, the elliptical ligament, articular capsule, and synovium were removed, and following additional lavage, the femoral heads were fixed on a drill in numerical order. The center of the specimen was longitudinally incised along the coronal plane with an electric pendulum saw. The femoral head section was harvested, coated with physiological saline-soaked gauze, and placed in a refrigerator for cryogenic freezing. Figure 2: Femoral head appearance and image measurement. Note: (A) Appearance of intraoperatively-resected femoral head; (B) The center of the femoral head was incised longitudinally along the coronal plane with an electric pendulum saw to identify the central point of the femoral head. A line from the longitudinal axis of the femoral neck to the apex of the femoral head passes through the central point (X); the line (Y) perpendicular to X also passes through the central point. (C–F) X-ray film, computed tomography image, design sketch, and Digimizer® software image of the femoral head. b: distance between the central point along the X-axis and the apex of the femoral head; c: distance between the central point on the Y-axis and the apex of the lateral femoral head; a is finally identified based on b and c measurements. The angles between a and b, as well as a and c are 45°. a, b, c: the actual heights of the middle, medial, and lateral femoral heads after collapse, respectively. To ensure freshness, the femoral heads were measured and recorded in a batch. All frozen femoral heads were thawed at room temperature 24 hours before use, and then lavaged with physiological saline. The intact femoral head was considered to be approximately spherical, and the coronal plane after the longitudinal cut was considered round. The center of the femoral head was longitudinally incised along its coronal plane with the electric pendulum saw, and the central point was determined on the coronal plane with drawing tools (vernier caliper, ruler, compass, triangular ruler, and goniometer). A line from the longitudinal axis of the femoral neck to the apex of the femoral head passed through the central point (X); a line (Y) perpendicular to X also passed through the central point. We measured the actual heights of the middle, medial, and lateral femoral heads after collapse [Figure 2]A, [Figure 2]B. All patients underwent hip arthroplasty. We used a biocompatible prosthesis handle with femoral neck that was co-developed previously by Germany's LINK Company (Waldemar Link GmbH & Co.KG, Hamburg, Germany) and the Italian artificial joint expert Professor Pipino. Considering the biomechanical characteristics of the hip joint (i.e., stress conduction is concentrated around the femoral neck), the bone around the femoral neck becomes the strongest bone. The prosthesis trial model and femoral head trial model were set, and the length of the lower limbs, hip joint range of motion, and dislocation area were measured. Based on the trial results, the appropriate prosthesis and femoral head were selected and fixed based on a biological or cement-type prosthesis selection method, followed by reduction. Pelvic anteroposterior and frog-leg X-ray examination and hip CT scans were performed. The patient was in a neutral position in abduction (anterior midline and lower limbs at a 15° angle; feet perpendicular to horizontal). The patient was supine in the examination bed, and the center of the body was centered on the center of the examination bed. Both lower limbs were straightened, and bilateral anterior superior iliac spines were equidistant to the top of the examination table. T-shaped shoes were worn to ensure consistency of the central position of the femoral head. Digimizer® V3.8.1.0 software (MedCalc Software, Mariakerke, Belgium) was used to measure the distances from the central point of the femoral head to three different apices of the femoral head on the healthy and affected sides on X-ray films and CT images [Figure 2]C, [Figure 2]E, [Figure 2]F. The heights of the middle, medial, and lateral femoral heads on the affected side on X-ray images were represented as a′, b′ and c′. The heights of the middle, medial, and lateral femoral heads on the affected side on CT scan were represented as a′′, b′′ and c′′. The heights of the middle, medial, and lateral femoral heads on the healthy side on X-ray films were represented as a1, b1, and c1. The heights of the middle, medial, and lateral femoral heads on the healthy side on CT scan were represented as a2, b2, and c2. Sensitivity of femoral head collapse detected by three methods: Sensitivity refers to the true positive rate: the percentage of overall patients with actual illness correctly diagnosed. High sensitivity indicates a high correct rate of femoral head collapse. Specificity, positive predictive value, negative predictive value, positive likelihood ratio, negative likelihood ratio, and diagnostic accuracy were calculated using the three methods. Specificity refers to the true negative rate: the percentage of actual disease-free patients correctly judged as disease-free according to the diagnostic criteria. High specificity indicates high accuracy of diagnosis. Positive predictive value refers to the proportion of patients with actual illness among all positive cases and can reflect the possibility of identifying the target disease in patients with positive screening test results. Negative predictive value refers to the proportion of patients with negative screening test results who do not suffer from the disease. Positive likelihood ratio refers to the probability of a person who has the disease testing positive divided by the probability of a person who does not have the disease testing positive. Negative likelihood ratio refers to the probability of a person who has the disease testing negative divided by the probability of a person who does not have the disease testing negative. A positive likelihood ratio > 10 or negative likelihood ratio < 0.1 significantly increases the probability of diagnosing or excluding femoral head collapse, in this study. Diagnostic accuracy is equal to [(the number of patients diagnosed with the disease in the patient group + the number of patients diagnosed as having no disease in the normal group)/overall patients] ×100%. Cohen's kappa coefficient was used to analyze the consistency of femoral head collapse measured by X-ray and CT scan at preoperative week 1. If there is complete consistency, then Kappa = 1. If there is no consistency, Kappa = −1. Kappa ≥ 0.75 indicates considerable satisfaction with the degree of consistency. Kappa < 0.4 indicates that consistency is not ideal. Measurements were used to detect decreased height of the femoral head. Generally, decreases > 2 mm are considered to indicate femoral head collapse. The morphology of the necrotic femoral head was observed using X-ray films, CT scans, and specimen measurements in each patient to identify the position and range of femoral head necrosis. Data collection: Case report forms were collected, and data were processed using Epidata software (Epidata Association, Odense, Denmark), collated, and then recorded electronically using a double-data entry strategy. Data management: The locked electronic database was accessible and locked only by the project manager. This arrangement was not altered throughout the study period. The Third Hospital, Hebei Medical University, China preserved all of the data regarding this trial. Data analysis: The electronic database was statistically analyzed by a professional statistician who created an outcome analysis report that was submitted to the lead researchers. An independent data monitoring committee supervised and managed the trial data, ensuring a scientific and stringent trial yielding accurate and complete data. Data open access: Anonymized trial data will be published at www.figshare.com. Statistical analysis was performed using SPSS 13.0 software (SPSS, Chicago, IL, USA) and followed the intention-to-treat principle. Normally-distributed measurement data with homogeneic variance were expressed as means ± standard deviation. Count data were expressed as percentages. The height of the femoral head was compared among groups using multivariate analysis of variance for factorial design. Main effect and interaction effect were calculated, and data between groups were compared using the least significant difference test. Intragroup comparisons in height of the femoral head on the affected and healthy sides were performed using the paired t-test. Differences in the indices (sensitivity, specificity, positive predictive value, negative predictive value, positive likelihood ratio, negative likelihood ratio, and diagnostic accuracy) were compared among groups using Pearson's chi-squared test using an R × C table. 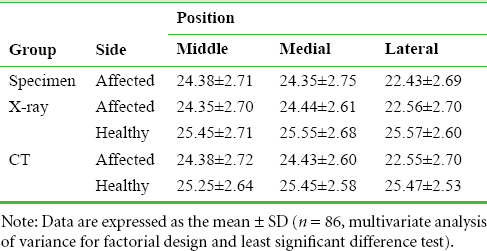 Differences in indices between groups were compared using a four-fold table chi-squared test, and intragroup differences between the affected and healthy sides were compared using McNemar's chi-squared test. Cohen's kappa coefficient was used to analyze the consistency of femoral head collapse measured by X-ray and CT scan at preoperative week 1. Kappa values were then calculated. The significance level was α = 0.05. Specimens have been collected. This is a retrospective registration. Baseline data: We enrolled 86 patients (50 cases of Ficat stage III and 36 cases of stage IV) with an age range of 32–68 years, mean: 50 ± 18 years, including 55 males and 31 females. There were 46 cases of a left affected hip, and 40 cases of a right affected hip. Changes in the height of the femoral head detected by different methods: The heights of the middle, medial and lateral femoral head were not significantly different on the affected side (P > 0.05; [Table 2]). General morphology of femoral head specimens: Different degrees of collapse, deformation, and chapped femoral head in the 86 femoral head specimens were observed during measurement. Cartilage exfoliation and fragmentation were found in most specimens, and large or partial bone defects or cystic changes were visible in stripped or broken cartilage. Osteoporosis, sparse trabecular bone, and decreased bone mass and strength were seen in a number of specimens. Collapse of the necrotic femoral head first appearing in the lateral upper quadrant occurs more often than in the inner upper quadrant and the middle femoral head, and is strongly associated with greater pressure on the lateral upper quadrant. This study aimed to preoperatively predict collapse of the necrotic femoral head to guide choosing the most appropriate surgical method. This trial hypothesized that if the actual height of femoral head loss is < 2 mm, but patients have cartilage exfoliation on CT images, patients should be considered for hip arthroplasty even if they are younger. 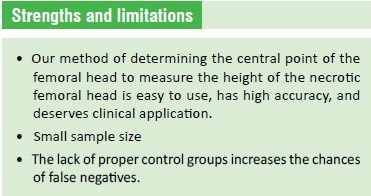 Our method of determining the central point of the femoral head to measure the height of the necrotic femoral head is easy to use, has high accuracy, and deserves clinical application. CT and X-ray measurements before hip arthroplasty highly matched measurements in intraoperatively-resected specimens. CT and X-ray results were consistent (expected Kappa ≥ 0.75), and both CT and X-ray effectively predicted collapse of the necrotic femoral head. Burian M, Dungl P, Chomiak J, Ošťádal M, Kubeš R, Schwarz O. Operative treatment for saddle-shaped femoral heads. Acta Chir Orthop Traumatol Cech. 2016;83:247-253. Amstutz HC, Le Duff MJ. Hip resurfacing for osteonecrosis: two- to 18-year results of the Conserve Plus design and technique. Bone Joint J. 2016;98-B:901-909. Kuroda Y, So K, Goto K, Matsuda S. Extremely early stage osteonecrosis of the femoral head in a patient with hip pain secondary systemic steroid pulse therapy for Vogt-Koyanagi-Harada syndrome: a case report. Int J Surg Case Rep. 2016;25:97-101. Church DJ, Merrill HM, Kotwal S, Dubin JR. Novel technique for femoral head reconstruction using allograft following obturator hip dislocation. J Orthop Case Rep. 2016;6:48-51. Fuchs B, Knothe U, Hertel R, Ganz R. Femoral osteotomy and iliacgraft vascrlarization for femoral head osteonecrosis. Clin Orthop. 2003:84-93. Sonoda K, Motomura G, Kawanami S, et al. Degeneration of articular cartilage in osteonecrosis of the femoral head begins at the necrotic region after collapse: a preliminary study using T1 rho MRI. Skeletal Radiol. 2017 doi: 10.1007/s00256-017-2567-z. Won Y, Lee GS, Kim SB, Kim SJ, Yang KH. Osteochondral autograft from the ipsilateral femoral head by surgical dislocation for treatment of femoral head fracture dislocation: a case report. Yonsei Med J. 2016;57:1527-1530. Zhang L, Sun X, Tian D, et al. Model establishment, mri and pathological features of early steroid-induced avascular necrosis of femoral head in rabbit. Zhongguo Xiu Fu Chong Jian Wai Ke Za Zhi. 2015;29:1240-1243. Jiang W, Wang P, Wan Y, Xin D, Fan M. A simple method for establishing an ostrich model of femoral head osteonecrosis and collapse. J Orthop Surg Res. 2015;10:74. Kang PD, Pei FX. Treatment of early avascular necrosis of femoral head (Ficat I, II). Zhongguo Gu yu Guanjie Sunshang Zazhi. 2010;25:91-94. Cherian SF, Laorr A, Saleh KJ, et al. Quantifying the extent of femoral head involvement in osetonecrosis. J Bone Joint Surg (Am). 2003;85:309-315. Kim YM, Ahn JH, Kang HS, Kim HJ. Estimation of the extent of osetonecrosis of femoral head using MRI. J Bone Joint Surg (Br). 1998;80:954-958. Nishii T, Sugano N, Ohzono K, Sakai T, Sato Y, Yoshikawa H. Significance of lesion size of location in the prediction of collapse of osteonecrosis of the femoral head: a new three-dimensional quantification using magnetic resonance imaging. J Orthop Res. 2002;20:130-136. Ficat RP. Idiopathic bone necrosis of the femoral head. Earlydiagnosis and treatment. J Bone Joint Surg (Br). 1985;67:3-9. Castilian P, Bartra A, Vallro G, et al. Hip arthroplasty with conventional stem as rescue treatment after failed treatment of intertrochanteric hip fractures. Rev Esp Cir Ortop Tranmatol. 2013;57:194-200. Li ZR. ARCO staging of osteonecrosis of the femoral head. Zhonghua Waike Zazhi. 1996;34:186-187. Wu T, Zhang GQ. Minimally invasive treatment of proximal humerus fractures with locking com¬pression plate improves shoulder function in older patients: study protocol for a prospective randomized controlled trial. Clin Transl Orthop. 2016;1:51-57. Yin PB, Long AH, Shen J, Tang PF. Treatment of intertrochanteric femoral fracture with proximal femoral medial sustainable intramedullary nails: study protocol for a randomized controlled trial. Clin Transl Orthop. 2016;1:44-50. Li Z. Minimally invasive closed reduction and internal fixation with fully threaded headless cannulated compression screws for repair of distal radius fracture: study protocol for a randomized controlled trial. Clin Transl Orthop. 2016;1:58-63. DQ conceived and designed the trial, and wrote the manuscript. YTH approved the final version of the manuscript. WHM, WXB, YWS and HJL assisted DQ to complete this test. All authors read and approved the final manuscript. Research ethics: The study protocol has been approved by the Ethics Committee of the Third Hospital, Hebei Medical University, China. All protocols are in accordance with Declaration of Helsinki, formulated by the World Medical Association. No data is reported in the article.